The Nikon D5100 DSLR Essentials Kit with 18-55mm VR Lens, put together by B&H gets you up and running from day one with the D5100, an 18-55mm VR lens, and a number of smart accessories. In the kit includes a 16GB SDHC card, a spare battery, a camera case, a 52mm UV filter, a wired remote, and a tethered lens cap holder. Start on your photographic journey with the basics in hand, with this essential kit. 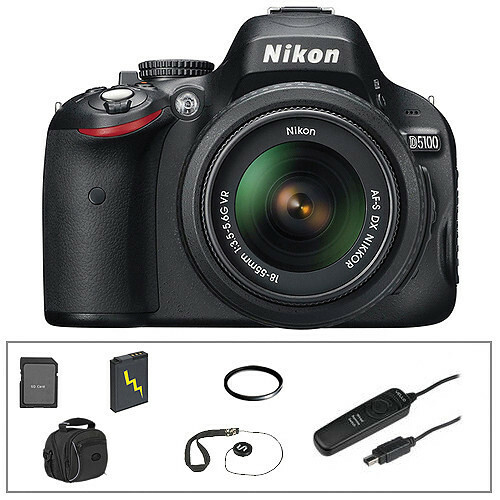 D5100 DSLR Essentials Kit with 18-55mm VR Lens is rated 4.0 out of 5 by 1. Rated 4 out of 5 by Sylvio Pereira from Excellent Camera I use this Camera in Hobby and travels with my family. Good for photos and movies, excellent option to editing before transfer to the computer. The flash is not so good and the auto-focus is not so fast (comparative with Canon flash and lens).